You’re a savvy wine country traveler. You have been to the Napa Valley and Sonoma on your own several times. Now you are ready to explore the Bordeaux wine country of France. Let me assure you that your best choice is to hire a driver for your visits to wineries. Bordeaux is a vastly different world than the Napa Valley. Hiring a driver will make your experience a memorable one. Hiring a driver for Bordeaux varies in price from 300 to 500 Euros a day, depending on your needs. The lowest price is for visits and appointments you’ve planned in advance. All you need is a driver to take you there. If you want a tour guide and driver to make appointments for you and take you through the backroads of Bordeaux wine country, it will cost more. There are many drivers available to take you around Bordeaux, but it is always best to have someone who is recommended. In the city of Bordeaux, you can ask the hotel concierge or ask at the Bordeaux city tourist office for help in arranging visits to Chateaus. We spent five days in the city of Bordeaux, all without a car. We arrived in Bordeaux via an express train ride on the TGV from the Charles De Gaulle airport. A beautiful, modern tram took us from the Bordeaux train station to the Hotel Majestic in the city center. Everyone in your group will be able to enjoy winetasting without having to worry about who’s going to drive on any given day. Why should someone miss out on tasting some of the greatest wine in the world? Visits to the Chateaus in Bordeaux are usually by appointment only, with reservations made several weeks in advance. Study up on Bordeaux and decide which areas you would like to visit. When you select a driver/tour guide, ask them to make arrangements to visit two or three wineries per day. Having them make a lunch reservation is also a good plan. This is always a big plus, even if a Chateau tour is in English. The well-known and established Chateaus will have tours in English. Our driver came with us on the tours and, when the tour guide was unsure of our questions, Paul jumped in to clarify in French. Why you need a driver in Bordeaux. We would not have found this view on our own. The experienced Bordeaux driver knows the countryside and can bring you to beautiful vistas and scenic locations. We asked our driver to stop at famous Chateaus so we could take photos. He knew exactly where to go and drove through the gates of Chateaus without a worry. He showed us sites we would not have found on our own. The above shot was a breathtaking view from a St. Emilion hilltop vineyard. There are many good tour guides and drivers for hire in Bordeaux. We found our driver Paul Pebeyre http://www.bordeaux-elite.com through a friend’s recommendation. Paul charges 450 Euros for a day of wine tourism. A day is a start a 9 or 10 am. depending on the program and ending the drive at 6 or 7 pm. Paul has a comfortable Mercedes Minivan for a panoramic tour, and he gave us great information as we drove through the Bordeaux countryside. Paul can arrange for appointments at wineries and book lunch reservations at winery restaurants. He joined us for lunch and helped explain the menu. Paul can also arrange a picnic lunch in the vineyards and provide lunch (price not included in daily fee). Most of all, Paul was a fine young man who was very courteous, caring and informative. We will hire him again the next time we visit Bordeaux. For our third and fourth visits to wineries in Bordeaux, we move to the southern area of Bordeaux to Graves. Today we visit a most charming and friendly winery, Château Smith Haut Lafitte. Upon our arrival, a cordial man opens the door for us and welcomes us to our tour and tasting. The man is no other than the owner of Château Smith Haut Lafitte, Daniel Cathiard. He gives us a heart-warming welcome and hands us off to our tour host. It was very impressive to say the least. During our tour, we see Daniel again, this time discussing equipment issues with his staff. He seems to be a true hands-on owner. Daniel Cathiard and his wife Florence purchased Château Smith Haut Lafitte in 1990. The winery was in need of some tender loving care and the Cathiards restored the Chateau to its former glory. The two have made many changes in the wine production and their wines today are very well respected. The estate grounds are magnificent, with beautiful works of arts scattered throughout the vineyards. Our tour guide takes us through the crush pad, where Sauvignon Blanc has just been harvested and is ready to be crushed in a blatter press. Daniel, the winemaker and the assistant winemaker take their first taste of the 2016 Sauvignon Blanc. They seem to be delighted with what they discover in the wine’s potential. We also visit a room with large wooden fermenting tanks, the barrel room, and the cooperage. Like Chateau Margaux, Château Smith Haut Lafitte is one of the few Bordeaux wineries that have their own cooperage, where the cooper makes and repairs barrels. The cooper can make four barrels in one day. Now to the tasting of two delicious wines. As you can see from the photo below, our tasting included the 2012 vintage of their famous red wine and the 2012 White Bordeaux. As you can well image, the price of these wines is very high. A taste of these wines is a very special treat. I must say the white wine, 100% Sauvignon Blanc, is among the best whites I have ever tasted. It sells for 80 Euros. In addition to the winery and cellars, Château Smith Haut Lafitte has two restaurants, a hotel, and spa. We had a scrumptious Tapas lunch at Rouge. Their other restaurant is La Grand’Vigne, a Michelin two-star restaurant. One of the highlights for the ladies in our tour group was a visit to the winery’s spa to purchase some Caudalie cosmetics. These successful cosmetics are derived from using grape seeds and grape skins from the Chateau’s wine production. They are said to rejuvenate the skin. Visits to this grand Chateau are difficult to make. Are you a customer of a fine wine shop in your area that sells Chateau Margaux? It is possible that the proprietor may be able to make a request on your behalf to arrange a visit for you. This is how we managed a visit to Margaux. Our seasoned tour driver admitted that this was the first time he had taken a client to Chateau Margaux. As we arrive the harvest activity at Margaux is beginning with the picking of Sauvignon Blanc grapes. Although Chateau Margaux is famous for its magnificent red, they make a small percentage of Sauvignon Blanc, and it has the label Pavillon Blanc du Margaux. Cabernet Sauvignon and the other Bordeaux grapes will be ready for harvest in one week. Chateau Margaux is in the northern area of Bordeaux in the Medoc and the wine appellation of Margaux. Chateau Margaux dates back to the 12 century. Chateau Margaux is one of one of the five designated Premier Cru or First Growth wineries in Bordeaux. Its wines are highly acclaimed and sought after and as you can imagine very expensive. We felt fortunate to be able to taste the 2004 vintage and the 2009 vintage of their second label Pavillon Rouge du Château Margaux. We walked through the cellar to view the wooden fermentation tanks and two beautiful barrel rooms. When the grapes are harvested each vineyard plot is kept separately in the large fermenting tanks. Once fermentation is complete the wine is transferred to barrels. It is not for several months that the winemaker and his assistant taste and evaluate the wine from each vineyard plot. It is only then that the wines are blended for the next vintage. The wine is blended in large tanks and then returned to the barrels pictured in the photo. 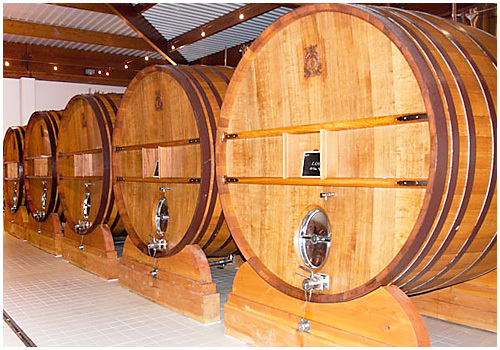 Chateau Margaux is only one of four Chateaus that makes their own oak barrels. In their cooperage center, they make barrels that provide 20% of the barrels needed for a normal vintage. The cooper can make one barrel in 4 hours. The cooper also fixes barrels that are leaking. The barrels at Chateau Margaux are used for two years only. It has been a tradition to make their own barrels and has been doing this for the last two centuries. The Chateau itself as can be seen in the photo above is a magnificent structure built 200 years ago. The current owner of Margaux, Corinne Mentzelopoulos, lives in the Chateau. As we walk around the estate my footsteps can almost feel each generation of families and winemakers who have lived and worked at Margaux. What a fantastic visit, one that will live in my memory bank very long. When is a sparkling wine from the Loire not a Crémant? unique manner and the outcome is a fantastic lively and crisp sparkling wine like no other. The label reads in French, “Et Vie Danse” and literally means “life and dance.” The bubbles dance and give one life’s pleasure. I am not sure, but I believe this is the only Loire Valley natural sparkling wine produced like this. The wine is made from a single variety of grape known as Menu Pineau. Have you heard of it? Probably not, and most of the existing vineyards are owned by Domain de Veilloux. They also use the Menu Pineau in one of their delicious white wines, a blend of 80% Sauvignon Blanc and 20% Menu Pineau. Arnaud ferments the Menu Pineau in old oak barrels. Before fermentation is complete, he “locks” the fermentation period by bringing the temperature down. At this point he bottles the wine and in the Spring when the temperatures rise, fermentation begins again and completes in the bottle. He then disgorges and corks the wine. 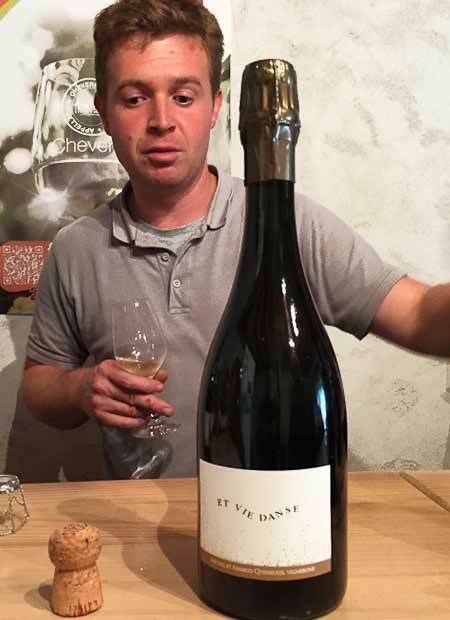 Only 1000 bottles are made of this unusual sparkling wine. Not only is it very good, it is also priced at 12 Euros a bottle. This is fantastic wine value! All the vineyards in Domaine de Veilloux are biodynamic and organically certified. A white, a Rosé and a red are made at three quality levels. Domaine de Veilloux also makes a wonderful Crémant. The owner of the house we were renting (La Menagerie) had a bottle of this Crémant waiting for us upon our arrival. It is an equal blend of Menu Pineau and Chardonnay. This winery was nearby, perhaps 3 kilometers away. It was a great visit on our last day in the Loire before heading to Paris. Just outside of the town Caune-Minervois, where we are staying in the South of France, is one of the best known and most famous wineries in the Minervois wine region of the Languedoc. It is Chateau Villerambert-Julien and indeed it is one of the most spectacular wineries we have visited on our current wine country getaway. The Chateau is a beautiful 16th Century Castle with a chapel that now functions as the winery’s tasting room. The setting is stunning as you drive the small road leading to the winery. The road is surrounded by vineyards with the majestic Chateau ahead. When I arranged for a visit to Chateau Villerambert-Julien, I had no idea that leading us on a tour and tasting would be none other than the owner and winemaker, Michel Julien. Michel is the fifth generation winemaker at the Chateau. How gracious it was for him to take more than an hour with us in the midst of what has been a very busy harvest season. As we strolled through the vineyards, Michel explains that this has been the latest harvest that he has experienced in recent memory. We watch as a mechanical harvesting machine works its way through the rows of vines. It is so interesting how this machine works. As it moves slowly but steadily through the rows it is able to take the grape clusters and remove the stems and the leaves from the grapes. The grapes, now loose in the machine’s bin, are then deposited into a special truck that contains a screw-type grape crusher. Now at the cellar we watch as the truck’s bed, filled with grapes, backs up to the cellar door. The crusher begins its work and the juice and skins are dumped into a receptacle and then pumped into a cement fermenting tank. These are Cabernet Sauvignon grapes, not one of the traditional grapes of the Languedoc. Syrah, Grenache, and Cinsaut are the common red grapes of the area. Michel recently purchased a neighbor’s vineyards, some of which are the Cabernet Sauvignon. Michel leads us to the historic chapel to taste some of the finest wines made in the Languedoc. Michel explains that he exports 60% of his wine. He exports to China, Belgium, the U.K. and Canada, but none to the United States. He expresses his frustration at not being able to get his wine into the U.S. markets. It is unfortunate that our three-tier system of wine distribution is a major stumbling block for the lesser known wine regions and small-to-middle sized wineries. What a shame for us not to be able to enjoy a large variety of worthy wines of the Languedoc in the United States. For our dinner on the last evening in the Languedoc we purchase two wonderful Château Villerambert-Julien wines. The 2012 Viognier is a beautiful and delicious white wine that makes a wonderful aperitif. The price is 9 Euros. The second wine is the Chateau Villerambert-Julien top-of-the-line red, the Incarnat. It is a blend of 80% Grenache and 20% Syrah from Michel’s best vineyards. The wine is a beautiful dark red color, complex and full of many flavors. The aroma is just huge. With the character and complexity of this wine, it is ideal for light to heavy red meat dishes. The price for this 2008 vintage is 14 Euros. At home a wine of this quality would easily reach the $40 or above category. Before we leave, we meet Michel’s mother in the garden thinning some beds of plants. What a delightful woman and so strong and vibrant. Her English is perfect and she talks to us like we have been long-time friends; this is a family-run winery that rings with passion. They are so proud of their wines. We are very impressed with the Languedoc wine region. It is largely an undiscovered area of France. It has many attractions and points of interest. For the tourist, things are less expensive and less crowded. The wines are well made, delicious and are excellent values for the price. We hope in the next few years, the Languedoc wines will become much more available in our wine shops across the U.S. As Michel Julien states, It will take a huge effort by the Languedoc wineries in time and money to get their region recognized as a premier wine growing region and one worthy of respect. Every day brings a new adventure as we travel the Champagne Route from our home base situated in the village of Le Breuil. Our travels on the last day of our trip took us to an area we have not explored previously, the western portion of the Marne Valley. Before we’d left on our trip, Gary Westby, the Champagne buyer for our local wine shop, K&L Wines, gave us a tip about a small Champagne producer making some fabulous Champagne. The name of the house is Collard-Picard and is located in the village of Villers sous Chatillon. Olivier Collard is the winemaker, and his wife Caroline Picard runs the PR side of the business. Both Olivier and Caroline come from families who have been renowned grape growers in Champagne for years. We tried to set up an appointment to visit Collard-Picard from our Le Breuil home, but without an answering machine or voicemail on our end, it was difficult to make contact. Finally, we decided to head to Villers sous Chatillon and take our chances, hoping to visit Collard-Picard without an appointment. The drive itself was worth the effort. This area is stunning and lined with tiny villages. We find the entrance gate to Collard-Picard open and enter the visitor center. Olivier Picard appears from his office, and we ask if it is possible to visit and taste some Champagne. With a quick phone call, Olivier rearranges an afternoon appointment so he can spend some time with us. He makes us feel comfortable and tells us that he is happy to receive us. This is a remarkable winery in more ways than one. This is a new facility (2005 opening) and beautifully appointed by Caroline Picard. She also has designed the beautiful labels for the various Champagne wines produced. The winemaking equipment is the latest. The grape press is only one of five in France and Collard-Picard is one of the few Champagne houses using sizeable wooden oak barrels to age their wine. Olivier Picard adamantly states that the most critical aspect of making Champagne is what happens in the vineyards. The state-of-the-art equipment only puts the finishing touches on the Champagne. The Pinot Noir and Pinot Meunier come from Olivier’s family vineyard nearby, and the Chardonnay grapes come from Caroline Picard’s vineyard in the Blanc de Blanc region of Champagne. After a brief tour of the winery, Olivier opens two bottles of Champagne for us to taste. We begin with the Collard-Picard “Cuvee Selection” Brut Champagne and then move on to the “Prestige” Brut Champagne, this one having been aged in the oak barrels. Ah, what a magnificent wine! The wood just adds an extra flavor to what is a delightful Champagne. We purchase one of each of these beautiful Champagne wines to celebrate the end of our wonderful trip to Champagne later that evening. Olivier points out that his production of 100,000 bottles per year is perfect to enable him to maintain the care that results in the quality of the wine. His wines are in high demand, so there are few new clients that he can allow to export or sell his Champagne. Should you ever find yourself in the Champagne region, make an appointment to visit this fantastic Champagne house. Luckily for us, K&L Wines is close by, and we can easily shop for this delicious Champagne.